Minneapolis’s public works department just completed a rigorous, long-term analysis of bike-car collisions, and they’ve released a trove of data. Bill Lindeke at Network blog Twin City Sidewalks says it might be “as good a study of crash data as you’re ever likely to see in this country.” There were a number of interesting findings, many of which bolstered previous research. What this suggests to me is that bicycle advocates should focus their efforts on increasing the total number of cyclists. In a way, safety issues will take care of themselves once we begin to increase the overall awareness and frequency of bicycling in the Twin Cities. Often, when talking about urban bicycling, arguments devolve into “bike vs. car” diatribes, with each group pointing out the other’s supposed misdeeds. There might be some validity to this kind of balanced framing, but it’s worth remembering that only one side of this equation has any physical vulnerability. Only one side is paying the physical cost. It’s the exact opposite of an equal relationship. 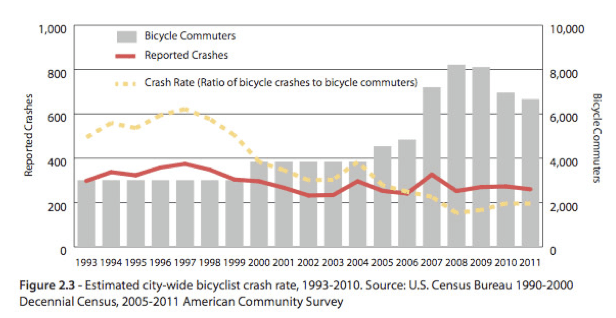 If only every city had the wherewithal and the motivation to monitor cycling safety so closely. In the meanwhile, less-resourced cities can likely learn a thing from this study. Elsewhere on the Network today: Greater Greater Washington writes the United States has only five “true” bus rapid transit systems, and those five are only rated “bronze” by the Institute for Transportation and Development Policy. Streets.mn wonders why so few Twin City-area bus routes take advantage of the highway system. And the Tri-State Transportation Campaign says it’s even more of a a shame that the new transportation bill reduced funding for Safe Routes to School, in light of a new New York City study that found the program significantly reduced traffic injuries and deaths among children.